...well, Miss Jingles, really. My DH pointed out that the snowperson is wearing a hat! Does that mean it has to be a "he". I think not! Anyway, because I coloured the scarf red and pink, I called it "Snow Princess". 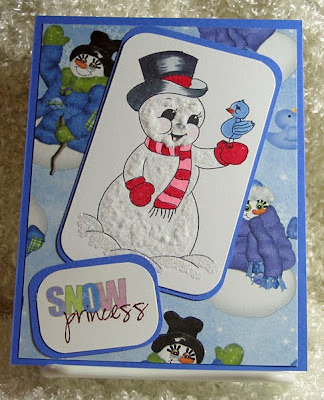 The image is from Digital Delights, the paper is from a kit called "Silly Snowman Gang" by Kathryn Estry, the "SNOW" wordart is from "Silly Snowman Gang" by Connie Prince both of which I picked up at Gotta Pixel. I coloured Mr. Jingles with Copic markers and the image was printed on Gina K. Designs Pure Luxury cardstock. 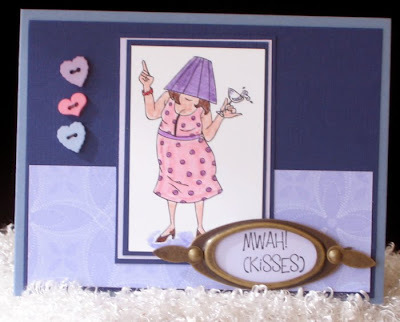 Here's a card I made for the first-ever Whimsie Doodles challenge at Paper Craft Planet. 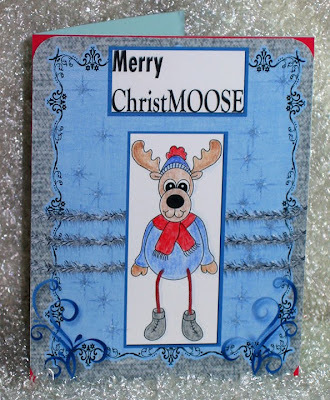 This card is printed on Whisper White, but the papers you see are digital papers, the image is, of course, Whimsie Doodles Gingerbread Greetings and the snowflakes are from my stash. It was fun making a "hybrid" card. What do you think of it? Maybe you should check out Whimsie Doodles for their cute images. This is for the Get Sketchy challenge GS #9. Their sponsor this week is Squigglefly. I went over there and found Shady Lady and had to have her. The base is Bordering Blue. I added some Night of Navy and Almost Amethyst on the mats with a bit of DP, also SU but can't remember the specific name. The hardware is Hodge Podge and buttons are from my stash. The Stamp Shack has weekly challenges and this is my week to host. I chose a Theme Challenge for Thanksgiving. Our Canadian Thanksgiving is on Monday, October 12th. This is the card I made for the challenge. So to all my Canadian readers, Happy 'early' Thanksgiving! If you remember, last week I won a prize from Whimsie Doodles. You can see the blog post here. Here's the first of what I know will be many, many creations. I think this seahorse is just adorable. Unfortunately, you can't see the glitter on the fin and top bits, but it looks really super, even if I say so myself. The base is Night of Navy. I added a bit of sea green c/s from my bits & pieces drawer and then placed some DP from Best Creation Inc. It's a beautiful DP with an 'ocean creatures' theme. 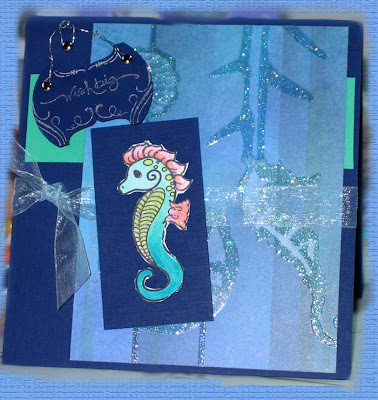 I cut out the seahorse and used dimensional glue-dots to adhere it to the small bit of Night of Navy. 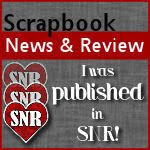 The sheer ribbon is from my stash and the sign is made with the SU punch and matching stamp set, Totally Tabs. Here's a little tip about digital images. If you look closely at the post below and click on the card to enlarge the image, you will see that the lines bled when I coloured with Copics. Today, I sprayed the images with hairspray, let the paper dry for a bit and then coloured, again with Copics. Voila, no bleeding of black lines into the colour. I'm going to keep doing that and perhaps you should give it a try, too. Mo's Digital Pencil has a new challenge blog, Mo's Challenge Blog and the first challenge is up and running. "Perple" was the colour to use. (It must be purple week for me, see post below.) I just picked up the Swine Flu (not literally) image a few days ago and he's been sneezing and coughing in my craft room, so I thought I'd air him out today. He's adorable and will most likely get used many, many times this coming winter. 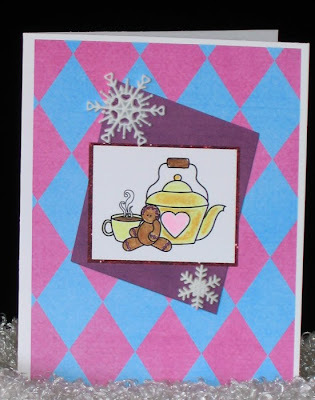 The card base is Orchid Opulence which I ran through the CB using the Swiss Dots embossing folder. The image was printed on Whisper White c/s and matted with a bit of Elegant Eggplant. The little labe is also Elegant Eggplant. I added some Glossy Accents to the crumpled up tissues to make them look wet, ewwwwhie, and a few brads in the bottom left corner to finish off the card. Since this is a digital image, when I downloaded the card into PS, I added a layer of sparkly stars in the background, just for fun! 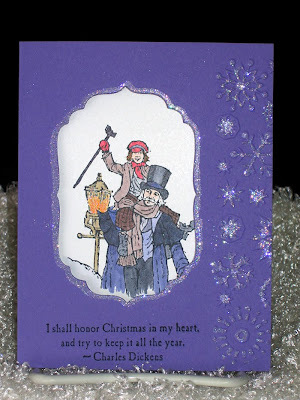 I won the "Caroler" stamp from The Little Paper Shop with this entry. WOO HOO! Now that I've been inspired again, the Monday challenge at Little Paper Shop was actually posted on Saturday to coincide with WCMD. The criterion for this challenge is to NOT use traditional Christmas colours, ie. red and/or green (except in tinny, tiny bits). That made me think about purples and blues and that's what I used. Because I don't have Katie Caroler yet, (I eagerly check my mail box now), I had to use one of my existing sets. I chose Keep Christmas by SU. 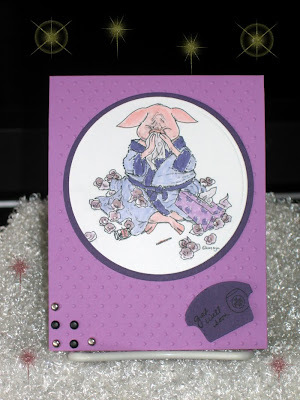 The cardstock is Lovely Lilac and the image is stamped onto Whisper White and coloured with my Copics. I used the CB Snowflake embossing folder just along the right edge and then added some Glamour Dust on the snowflakes and around the Nesties frame from the Labels 4 set. I love the way it turned out! I don't want to be greedy, but they're giving away a huge prize for this challenge so, go ahead, make a card and enter the challenge. In honour of WCMD, several places were hosting challenges. I chose to make a card using the sketch and colours provided on Follow Your Heart. I pulled out a stamp set from Pink Cat Studio which has 14 Billy Stamps. I thought the Super Hero fellow was particularly cute and inked him up. 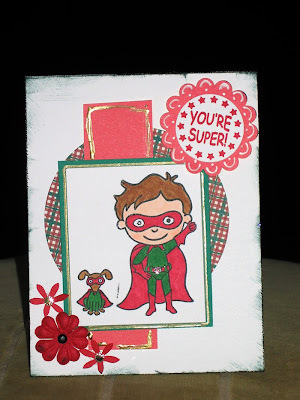 The card base is Select White by PTI, the DP is Shabby Princess by BoBunny. I coloured Billy using Copic Markers. The scalloped punch is the mat for the sentiment and I added a little bit of white Souffle Pen. The flowers are from my stash. As a final touch, I added a little gold around the image frame and on the red peace, too. That's it and I hope you like it. Before I actually begin this post, let me say that this card was totally CASE'd from Boni of Bonibleaux Designs. I needed a card quick and I loved your card so much, I had to copy. I hope your are flattered and not offended. Our condo Social Committee hosts a 'coffee' hour on the first Thursday of each month. 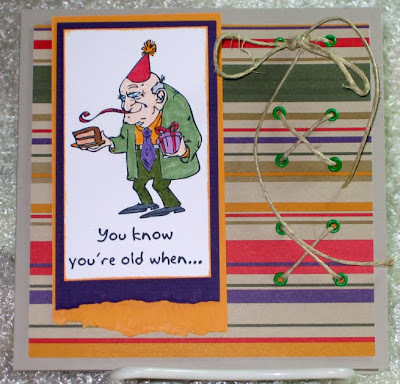 Today, one of the group brought cake to celebrate his 80th birthday and this is the card I made for Jack. The inside reads: "and what doesn't hurt, doesn't work!" I was so hoping that Jack would not be offended as we've only known him about a year or so. I'm happy to say he loved his card.